On April 3, 2018, Human Rights Watch (HRW) issued an “analysis” of the March 30, 2018 events along the Israel-Gaza border – marking the NGOs further descent into exploiting human rights for the doctrine of hate. Like other HRW responses, this latest publication lacks credible methodology and manipulates the presentation of facts and law to advance a political narrative rather than engage in professional human rights research. It denies Israel’s sovereign right to defend its border, erases the context of Palestinian terrorism and Hamas’ rejectionist agenda, and promotes Hamas propaganda. In advance of the well-publicized events on March 30 (the first in a series of scheduled “Return Marches”), NGO Monitor noted the high probability for violence behind the façade of a peaceful protest. We highlighted that given that Hamas, Islamic Jihad, and the Popular Front for the Liberation of Palestine (PFLP) terror groups were involved in organizing the event that human rights groups should caution against participation in this confrontation. The organizers also made clear that the use of children would be an integral part of the riots. Nevertheless, HRW, ostensibly favoring a cheap propaganda victory (similar to Hamas’ own goal) against Israel, ignored these warnings and remained silent. HRW’s failure to speak out against confrontations that would likely cause casualties and the use of children as human shields is not in keeping with the core principles of universal human rights. The prioritizing of politics over protection is not surprising given that HRW’s Middle East staff is made up of several anti-Israel demagogues and BDS (boycott, divestment, and sanctions) activists. HRW has no military expert on staff and lacks access to necessary information regarding the events of March 30. As such, the NGO has no ability to conduct a credible investigation. Instead, after only three days, HRW rushed to publish an analysis for the sole purpose of attacking Israel. The NGO fully adopts the Hamas narrative, relying on “evidence” from the Gaza Health Ministry (a Hamas institution), six unnamed witnesses, three unidentified journalists, and an assortment of unknown videographers. It buries at the end of the report and tries to discredit the fact that at least 10 of the 16 killed were members of Hamas or Islamic Jihad. HRW claims it “reviewed footage it believes authentic based on an interview with the videographer that appears to show a demonstrator shot in the leg while praying…” As media analysts have shown, the video is likely manufactured by Hamas for propaganda purposes. Notably, the video shows a group of individuals on their knees praying facing the border, when one appears to be suddenly shot in the back of the leg. Despite his presence in a large crowd, he is the only individual that runs away while everyone else remains praying. It lacks credibility that if the IDF was indiscriminately shooting into a crowd of worshippers, as HRW alleges, that only one person would leave the scene. Given many past incidents of Palestinians staging deaths and injuries to garner media attention, no credible organization should rely on this highly suspicious video. Calling into question other HRW source material, the NGO links to a journalist, Adli Abu Taha’s, Facebook page. Approximately five months ago, Taha shared a Hamas video “in memory of the Gilad Shalit kidnapping” – the caption reads “On the fourth anniversary of Operation ‘Anonymous Gate’, al-Qassam publishes a new video clip for the families of Gilad Shalit” (translated from Arabic). Taha has also shared videos calling for violence against Israeli leaders, praising a terrorist who killed two Israelis in Jerusalem, and of a PFLP terrorist rally. 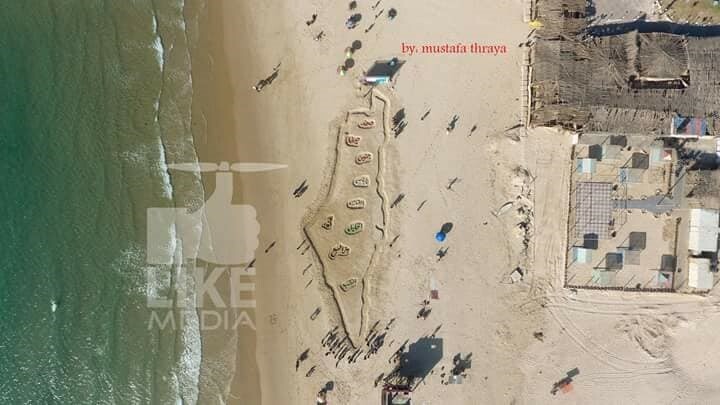 Another Facebook page cited by HRW, “Days of Palestine,” posted that “Before being murdered by the Israeli Occupation during the peaceful Great March of Return last Friday, Mohammed Abu Amro, was going to sculpt a 100 meter sized map of Palestine on the beach of Gaza. Today his friends made his dream come true and finished the map. Rest in peace Mohammed knowing that there are people who will always continue with your legacy.#GreatReturnMarch.” Amro was identified as an “operative of the Hamas terror organization’s tunnel digging initiatives.” The “100 meter sized map of Palestine” is a map of the entire State of Israel, the West Bank, and Gaza. It is interesting to note that in this publication, HRW does not refer to Gaza as “occupied,” as it normally does. This deliberate obfuscation allows the NGO to wrongfully apply a “law enforcement” paradigm to Friday’s events, instead of the rightful international humanitarian law (IHL) (armed conflict) paradigm. HRW refers repeatedly to irrelevant and unbinding UN principles relating to law enforcement. Under the IHL paradigm, combatants can be targeted as well as civilians directly participating in hostilities for any reason as long as the attack complies with the rules of proportionally. Considering that tens of thousands of individuals were present at Friday’s events and only 16 were killed – at least 10 identified as being members of Hamas or Islamic Jihad – the IDF clearly acted within international standards. HRW has provided no credible evidence that the targeted individuals were not combatants, nor engaging in hostilities at the time. Under international law, a country has an unfettered right to defend its border from hostile attack. Instead, HRW absurdly claims that the “Israeli government presented no evidence that rock-throwing and other violence by some demonstrators seriously threatened Israeli soldiers across the border fence” and that these individuals “posed no imminent threat to life.” As noted, the standards of “seriously threatening” and “posed no imminent threat to life” are used in a law enforcement situation, not a paradigm of armed conflict and a hostile border confrontation. Even so, HRW has no knowledge whether soldiers’ lives were threatened nor in what activities the targeted individuals were engaging (according to media accounts, Hamas operatives were engaged in planting IEDs on the border and were attempting to damage the security fence and/or find vulnerabilities in order to infiltrate Israeli communities). HRW further does not indicate at what precise point the IDF should be able to use force nor does it recommend what IDF “restraint” might look like. HRW regularly condemns Israel’s use of tear gas and other non-lethal methods of crowd control, indicating that any action taken by the IDF to defend its border would have been deemed “excessive” by HRW. HRW’s statements also fail to inform readers that numerous Israeli communities are located in close proximity to the border, and that Hamas has repeatedly attempted to infiltrate the border (both via tunnel and land incursions) to carry out attacks on the civilian population and to kidnap soldiers. The IDF was stationed near the border on March 30 to protect these border communities and to ensure a mass influx of fighters did not swarm into Israel. HRW favors Hamas’s “evidence” and narrative, demonstrating that the NGO is interested in promoting Hamas’ political agenda. If HRW was a credible research organization interested in protecting universal human rights, it would explain the situation evenly, acknowledging the various actors – including voices within both Israeli and Palestinian society – and conclude with recommendations for improving the human rights situation for both Palestinians and Israelis. Instead, HRW ignores the threat that Hamas and other terrorist factions pose to both Palestinian and Israeli civilians and negates any analysis of human rights violations perpetrated by Palestinian factions. For example, HRW does not mention the recruitment and use of children as soldiers – as seen in children throwing rocks and approaching the border – and it ignores the use of children as human shields – acutely noted by Hamas sending a 7-year-old Palestinian girl through the border. The IDF was able to reunite her with her parents without her being injured. HRW does not acknowledge the context of Land Day, whitewashing it as an event “held annually on March 30 to highlight the dispossession of Palestinians over the years.” Instead, the purpose of the March 30 event, according to the Hamas organizers, “affirms that our people can’t give up one inch of the land of Palestine.” The protests are therefore not aimed at promoting a two-state framework for two peoples living side-by-side in peace. Rather, HRW is promoting a hostile and aggressive agenda aimed at eliminating the Jewish state and self-determination of the Jewish people. The adoption of this destructive and racist agenda by HRW is further reflected in its hiring of an outspoken BDS activist to head its “Israel and Palestine” desk.